In the box marked "Keyword Search," type in words that describe the kind of client management job you are looking for. For example, you might enter client management job title or required skills. To search for a particular client management job title (for example, "director"), simply enter the keyword in the box: director. Keep adding more options in the "Keywords" box till you get satisfactory results. If you have entered one or more keywords, client management jobs containing all of the words specified by you, will be displayed. If you want the keywords to be searched by client management job title or job description or both, mark or unmark the option box. Your client management job search results get stored in this area which is situated at the lower left side of the page below the "Employer/Recruiter" section. You can access your most recent job search results here. This feature is activated only after you have signed up. Use the form below the static textbox besides client management 'Job Title Search' and your search criteria will automatically appear in the static textbox. "With all of these words." This field allows you to search for client management job listings including all the keywords you have specified. For example, if you type in "Investment Banking Officer," Preferred Resumes will search for all client management jobs with the keywords " Investment ", " Banking," and "Investment Banking Officer ". "With the exact phrase." This field allows you to search for client management job listings including the exact phrase you have specified. For example, if you type in "marketing manager," Preferred Resumes will search for job listings with the exact phrase "marketing manager". "With at least one of these words." This field allows you to search for client management jobs including at least one of the keywords you have specified. For example, if you type in "marketing manager," Preferred Resumes will search for all client management job listings containing the keywords "marketing", "manager," and "marketing manager". "With none of these words." This field allows you to search for client management job listings without the keywords you have specified. For example, if you type in "marketing manager," Preferred Resumes will list all jobs without the phrase "marketing manager". Note: You can keep revising your search string to improve your results set. Also some names and phrases are better known by their abbreviations than their full forms. To make sure you don't miss any client management jobs, however, use both abbreviated and unabbreviated forms together. For example, enter: AVP and Assistant Vice President in different text boxes in the "With at least one of these words" section for best results. This option allows you to search client management jobs from more than one city in the state you choose. Select a state and then select one or more cities within the state from the adjoining list box where you want to want your client management job to be based from. 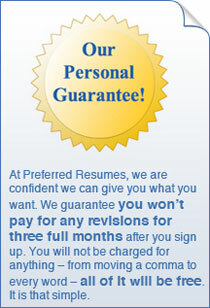 Preferred Resumes premium users can search for client management jobs by company name. To search for client management jobs in a particular company (for example, "JP Morgan"), you can enter the company name in the given search box.